I had good intentions on baking a recipe out of one of my 50+ cookbooks that I rarely use. I usually like to develop my own recipes, but it was too late in the evening for calculations and measurements. Laziness prevailed, so I grabbed Thomas Keller’s Bouchon Bakery off my shelf and thumbed through it until I found a recipe that required half rotten bananas. I refuse to eat half dead bananas. I find them gross and unappealing. So, in a mixing bowl they went. As usual, I start off with the intention of using the recipe I just selected from the shiny book I just grabbed off off the shelf mere moments before turning on the oven, but after looking over the recipe, I realized I didn’t have all of the ingredients listed. Organized, I am not. My butter was frozen and not at the recommended room-temperature. Creme fraiche? Who keeps that stocked in the fridge? I already mashed my bananas, so I had to do something with them. I started throwing one ingredient after another into the bowl and mixed it all up. I recklessly scooped the batter into my greased muffin tins, threw the pan in the oven, and prayed that they would turn out. The result was banana muffin perfection. The muffin tops were perfectly rounded, the streusel was perfectly browned, and the muffins were baked to perfection. With my fingers crossed, I unwrapped the muffin and took a bite. You guys… Talk about a banana muffin. 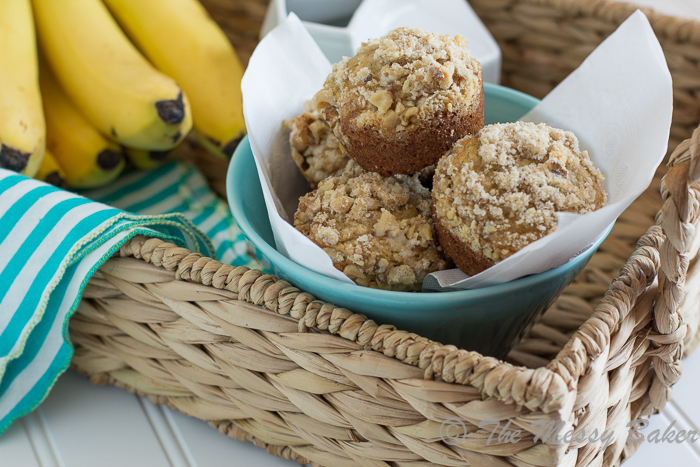 This banana muffin beats every other banana muffin recipe I’ve ever made–no comparison. 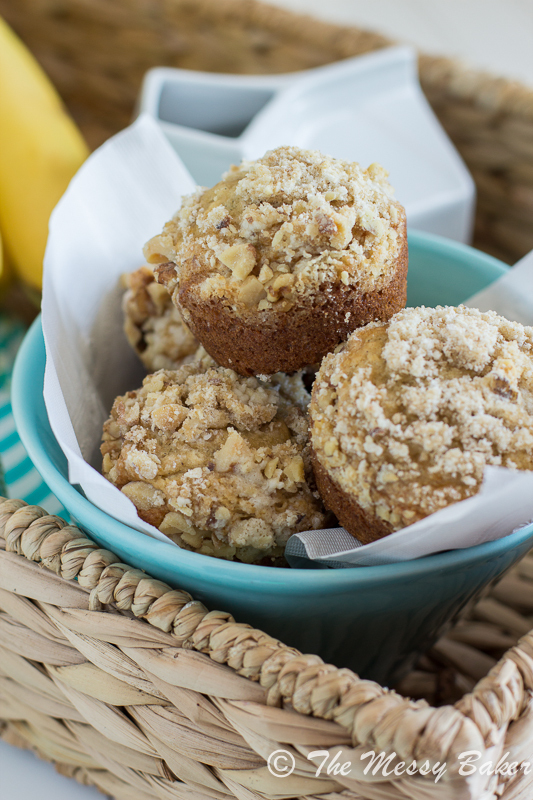 These muffins aren’t your average banana muffin. They’re light and fluffy and not at all dense. The texture is unbelievably soft and moist. They melt in your mouth at first bite. Oh so buttery and perfectly sweet. Afte I made these, I told Squirrel that I should probably write the recipe down before I forgot it. His response was, “Yeah, you should should probably write this recipe down.” I suppose he liked the muffins. I may not have followed Keller’s recipe, but I did learn a very useful trick that yielded perfectly domed muffins. No flat muffins here! Preheat your oven to 425 degrees F. Place your muffin tin in the oven. Close the door and turn your oven down to 325 degrees F. The high heat of the oven helps the muffin batter rise quickly so they don’t sink. Cool, huh? I proceeded to eat my weight in banana muffins. We loved these muffins so much that I’ve been baking them every chance I get. Preheat the oven to 425 degrees F. Grease or line a 12-cup muffin tin. In a small bowl, whisk together dry ingredients; set aside. In a large bowl, add the bananas and brown sugar. Using a potato masher or fork, mash until the mixture is smooth (there will be some small chunks). Whisk in Greek yogurt, egg, and vanilla paste or extract. Slowly whisk in the melted butter until the mixture is smooth. Fold in the the dry ingredients until just combined. Scoop the mixture into your prepared muffin tin, filling them 3/4 of the way full (do not over fill). Top with 2 teaspoons of the walnut streusel topping. Place the muffins in the oven. Turn down the heat to 325 degrees F. Bake for 20-22 minutes or until a tooth pick inserted in the center comes out clean and the tops are slightly golden in color. Cool in the pan for 5 minutes before transferring the muffins to a wire rack to cool completely. In a medium-sized bowl, add the flour and butter. Using a fork, cut the butter into the flour until it resembles a coarse crumb. Mix in the brown sugar and chopped walnuts. can i just mention that when you’re feeling lazy and don’t want to deal with calculations and measurements, opening the TK Bouchon book is almost NEVER A GOOD IDEA. BUT! I like how you made it work for you here, and you have wonderful banana muffins now! No one keeps creme fraiche in their fridge but Bobby Flay, btw. I sometimes have it, but it’s not just like, “oh hey, isn’t there some leftover creme fraiche? there sure is!” no. i love banana muffins. especially the whole banana/walnut combo, and now you’ve reminded me that i have the bouchon cookbook and NEED to open it. i get scared/intimidated by it sometimes, but that’s silly. His book is a bit daunting, I agree. He does things like 1.5 ounces of eggs…what? But, he knows what he’s doing, so I should just follow along. Yeah, if I have creme fraiche in the fridge, it’s for something specific. I couldn’t agree more, Anita. That darn frozen butter. I should know better to keep plenty in the fridge, but I don’t. How wonderful that these “accidental” muffins had such a great result. I love when that happens! And I’m definitely going to try the trick of starting the oven off at 425, and then reducing the temp to 325 — I had when my muffins don’t hold their dome-like shape. It’s the best when a recipe you’ve just thrown together turns out so well. These muffins look killer! Love the walnut streusel. Walnuts and banana muffins go so well together but I don’t always want them in the muffin. Perfect compromise! Mmm, I can taste them for breakfast! 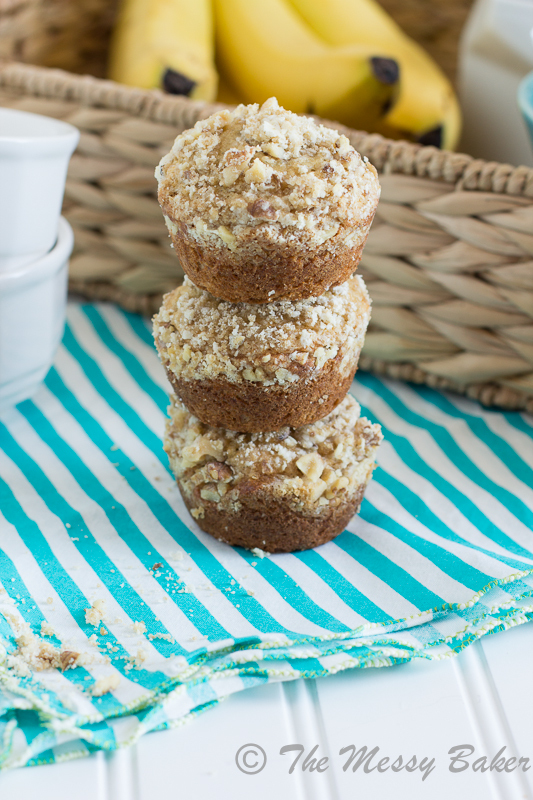 Banana muffins are already one of my favorites, but that streusel takes it to the next level! As soon as a banana turns brown or gets a dent, it is dead to me. And now I have somewhere to bury them. Thank you, Accidental Banana Muffins. Thank you. You’re awesome-it’s so amazing how you were able to just end up whipping these beauties up! YUM! Those do look like banana muffin perfection!!! I find it even hard to find creme fraiche in the grocery store here. They used to carry it but not anymore!! these look so so so so so good Jennie! Definitely trying these soon! These are probably the best looking banana muffin I’ve seen lately. I can’t wait for my green banana’s to turn. Great Recipe!! 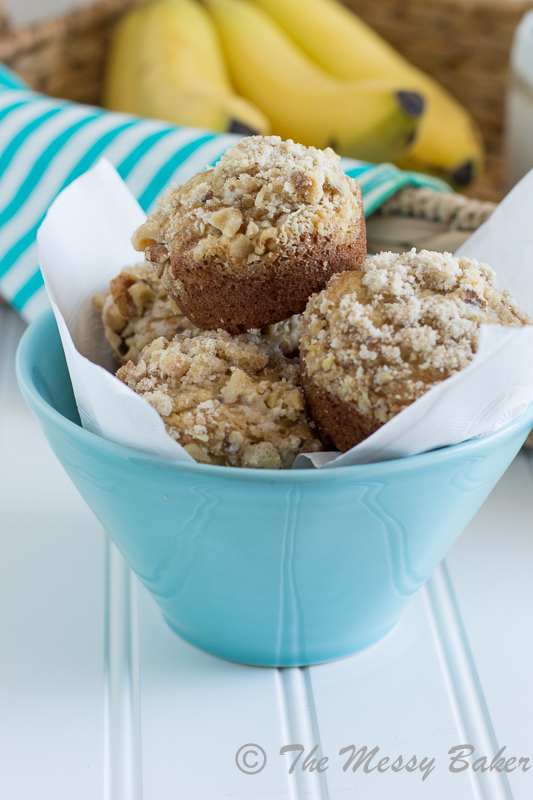 I love me some banana muffins and the walnut streusel is perfection! I am ALWAYS on the hunt for banana muffin perfection so I’m super excited to try your recipe, Jennie. I wish my kitchen experiments turned out as perfectly and beautifully as these muffins! I’m especially in love with that streusel topping, yum!